1. What do you like about working in the not for profit sector? There are so many upsides to working in the not for profit sector: one of which is meeting the great people who go out of their way to make the lives of vulnerable people a bit easier. I never stop being amazed by the volunteers who work in our sector and the time they commit to help community organisations. We are so lucky to receive financial support from our community through funding and grants. I am completely invested in ensuring we deliver a high quality service to our clients to increase their independence, well-being and connection with their local community. 2. How is St George Community Transport different from the other organisations that you’ve worked for? their daily communication and service delivery. I have been very fortunate to have been so warmly welcomed into my new role. 3. Last week was your first week in the chair Carol – what do you see as your immediate challenges? There is always a lot to learn in any new job and I am excited to get to know all the team. I am fortunate to have the support of our Board of Directors, staff and of other transport organisations to assist with new challenges. 4. What’s on for week 2? 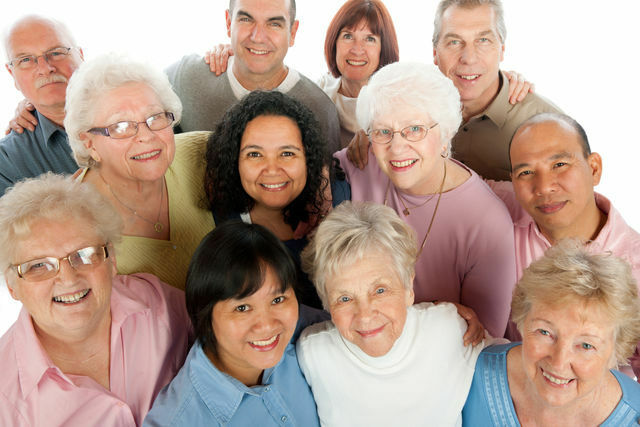 I am looking forward to meeting our clients and will be attending the St George Aged Care Expo tomorrow (30 Aug). Carol with some of our team in front of "Bernie"
... that all of our buses are named after former drivers and staff of St George Community Transport? Here are some of our office staff and volunteers who got the chance to go for a ride in the newest bus in our fleet today - "John". 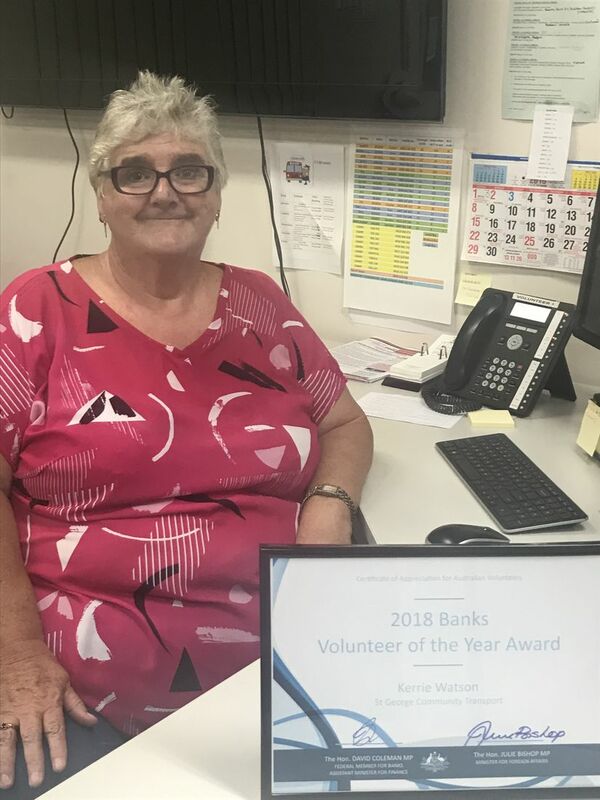 ... to our very own Kerrie Watson who received the 2018 Banks Volunteer of the Year award. The awards were presented by the Hon. 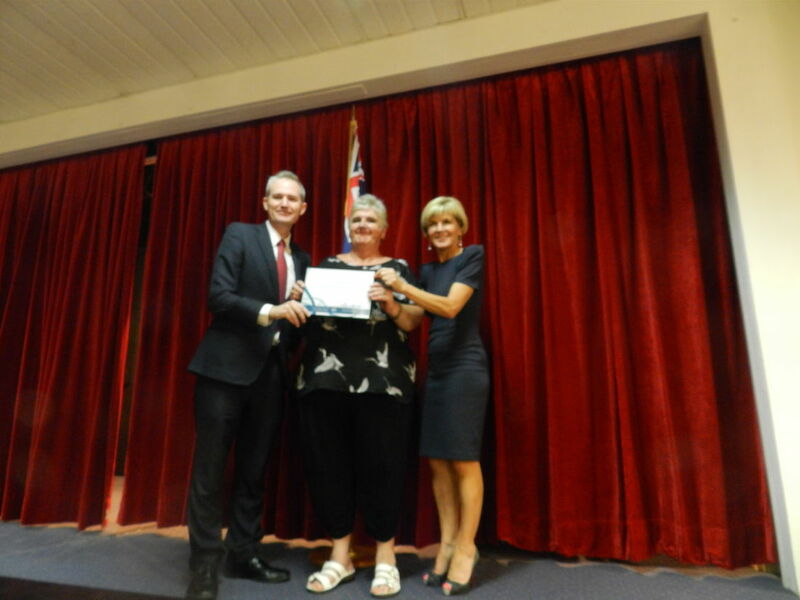 Julie Bishop MP (Minister for Foreign Affairs) and the Hon. David Coleman MP (Federal Member for Banks) at Penshurst RSL on Tuesday evening, 3rd April. 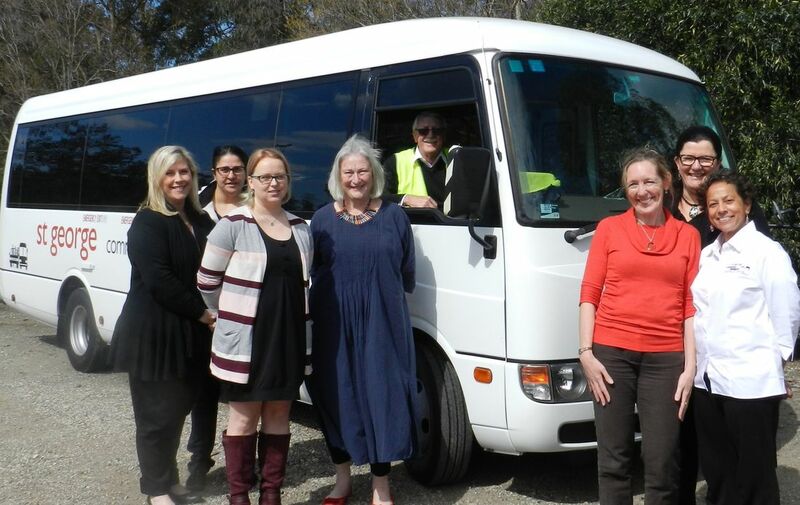 Kerrie started as a volunteer driver in 2002—you’ve probably seen, or even ridden in our “Kerrie” bus—and she now works in our office as one of our lovely Service Delivery officers, taking your bookings over the phone.